Harmony Hill Vineyards is excited to be opening for our 16th season on May 25! Harmony Hill Vineyards and Estate Winery hopes you will join us for our 2019 summer season opening on May 25th. The winery is celebrating our 16th season of fine wine, great music, and gathering friends. To see a list of all of our available wines go to "Our Wines". It's all about Fun, Friends, and Fine Wine. 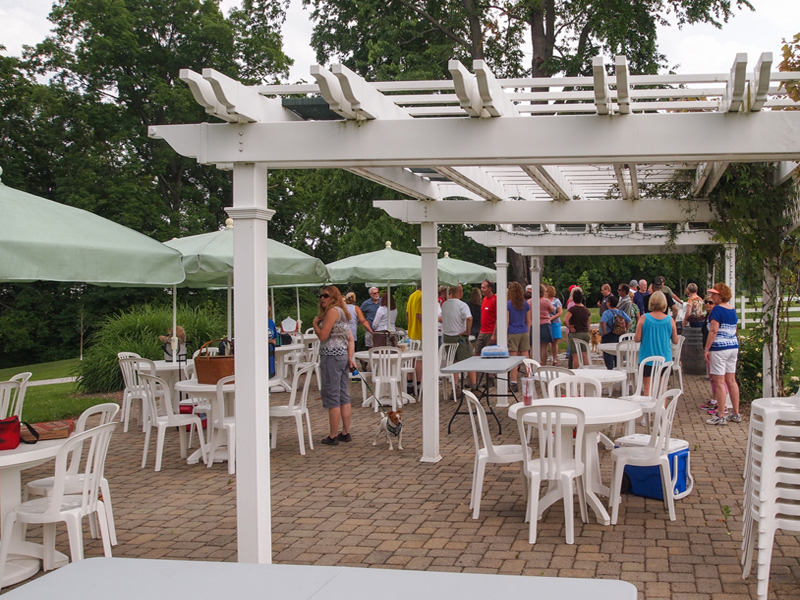 Harmony Hill Vineyards & Estate Winery is southwest Ohio's premier winery/entertainment destination. We are a small boutique winery nestled in the quiet village of Bethel, just miles from the historic Ohio River Valley. Harmony Hill features a picturesque country setting surrounded by our 72 acre Nationally Certified Wildlife Refuge farm. Our unique underground wine cave is one of only eight similarly built structures in the United States. Sample our premium award winning wines among the fermentation bins in the working winery or view our vineyards from the covered outdoor cafe. The Tasting Bar is open for samples during all normal visiting hours, and by special request for private parties of 20 or more. Miles of walking trails, pristine flower gardens and manicured grounds make Harmony Hill the perfect destination for those who yearn for a taste of the country, daily featuring some of the best regional entertainers in Ohio. We do not serve food, but picnicking in the vineyards or under the shade of the hundreds of trees that surround the winery is encouraged. (Please remember that Tate Township is dry, so it is illegal to consume ANY alcohol other than Harmony Hill wines on this farm). Harmony Hill has been featured in the Wall Street Journal, Ohio Magazine, Cincinnati Enquirer, Milford-Miami Advertiser, The Community Press and Dayton Daily News, as well as PBS Americas Heartland television series. 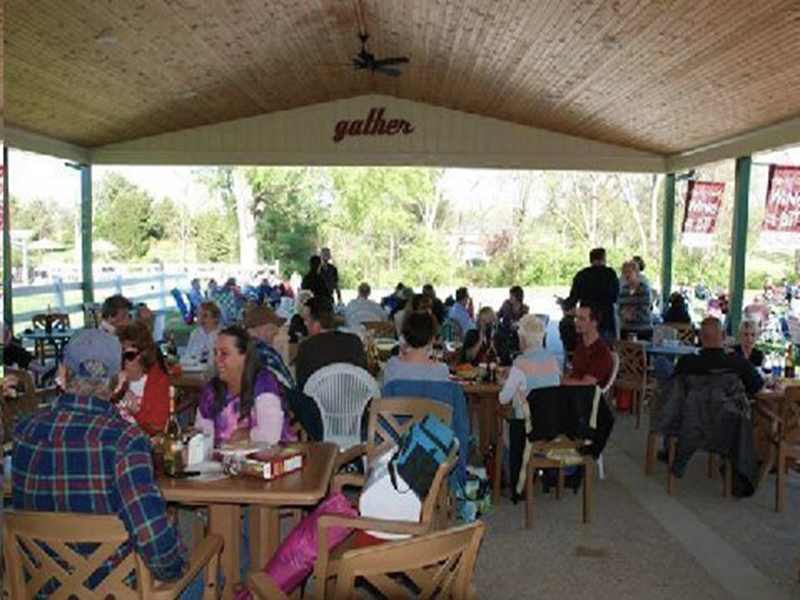 Considering an outdoor event? Choose Harmony Hill Vineyards and Estate Winery as the destination for your next celebration. Our event planners and vineyard/winery grounds are available for private parties and weddings throughout the summer. Our staff will host groups as small as 25 and as large as 200. 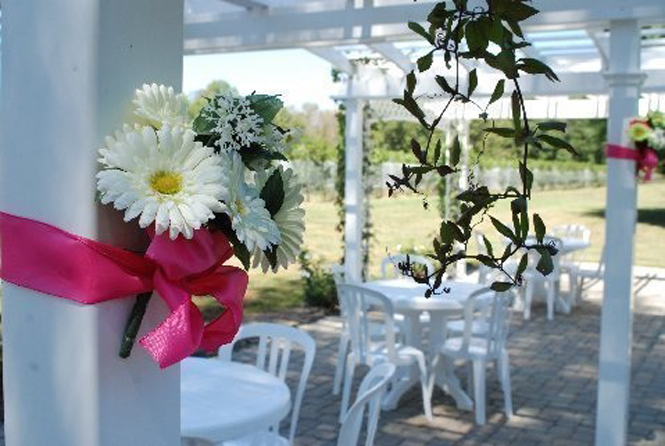 Our newly constructed wedding pergola placed directly adjacent to the vineyard is the perfect private location for parties of less than 75. Catering, entertainment and tent rental can be managed by our event coordinator if you so desire, or you are free to bring your own. Click here for more photos. Harmony Hill listed in American Winery Guide's Most Dog Friendly Wineries. "Pet owners love bringing their pets to Bill and Patti Skvarla's vineyard and the tasting bar, but where Harmony Hill Vineyards really spreads the joy is with their pet events. In addition to hosting five or six adopt-a-pet events every season, Harmony Hill is the host site for CincyMeetUp, a dog-lovers group that hikes the seventy acre farm two to three times a summer. Christmas at the winery brings the popular "ReinDog Competition" where visitors bring their pets dressed for the holidays and compete for ribbons. When you visit the winery, take some time to seek out the Skvarla's rescue pets and give them a little love!" Proud members of WineAmerica, Ohio Proud, and the Ohio Grape Industries Program. Featured at Savvy Wino. Friday: 5:00 p.m -9:00 p.m. Saturday: 2:00 p.m.- 9:00 p.m. Summer Holidays: 2:00 p.m.-9:00 p.m. Visitors to Harmony Hill must be at least 18 years old.